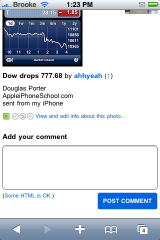 Flickr – Now iPhone Optimized! You are here: Home / flickr / Flickr – Now iPhone Optimized! Flickr has launched a new iPhone optimized site. 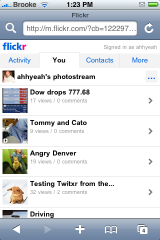 If you love flickr, you will LOVE their new mobile site! 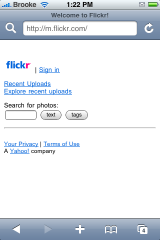 It offers basically all the functions of the “normal” flickr website. You are able to view recent activity, your recent activity, your contacts recent activity, your contact list, search, view comments, leave comments, view your favorites, sets and collections, star a photo, view the photo in a larger size…etc. It is really really nice. I was also surprised by how quickly the site runs. I was on WiFi and it ran really nicely! 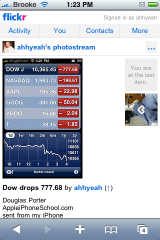 The only thing the mobile site does not have is the ability to organize your photos and a slideshow option. You will definitely want to check it out to get the full feel of the new site. Just head over to m.flickr.com. Screenshots below. I miss iFlickr sooo much. You probably remember it as the best jailbroken app for 1.1.4. You were able to take pictures and send them directly to your photostream or set. There is a couple flickr apps in the app store right now but they are not nearly as good as iFlickr was. 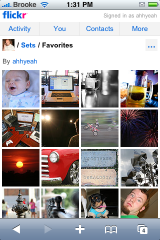 These new flickr apps keep messing the orientation of my pix when uploading them. How do you port apps to 2.0 ? I can get iFlickr to Cydia for free. Who wants to spend $3 to buy MobileFotos !! !